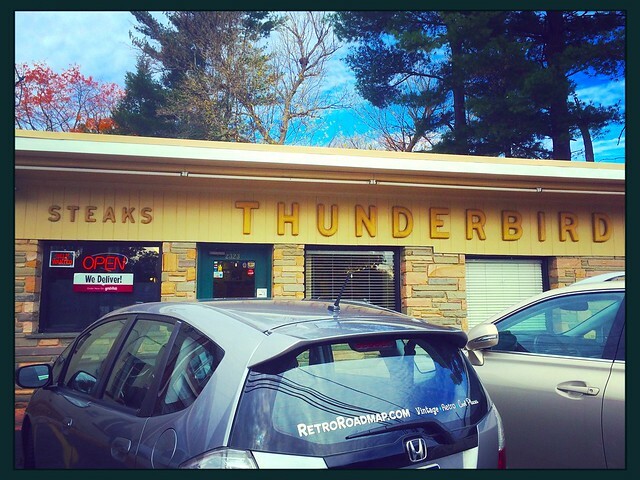 2017 Update: Retro Roadmappers on Facebook alerted me that the Thunderbird was closing for renovations in late April, so we were all a bit concerned that this might include obliterating some of the vintage charm we love so much about this place. Never fear - Mod Betty popped by recently to find the place in fine form. OK, so I'm a bit bummed that the hairpin legged tables had been replaced, but they also upgraded the stacking "banquet" chairs, so I call that even. Most of the important renovations happened behind the counter, so the front of the house was given a new paint job and cleaning while they were closed. 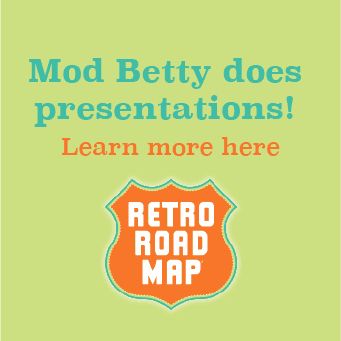 You KNOW Mod B thinks many Retro Roadmap worthy places could benefit from "a good scrub" so this was good news. Don't worry - the place is as bustling as ever - I just waited and waited 'til the families, couples and solo diners departed so I could post this photo without disrupting too many meals. Speaking of meals? I had to get a pizza, since they serve mini-sized ones, and their style of pizza reminds me a bit of the type we'd get up home in New England. Hit the spot! 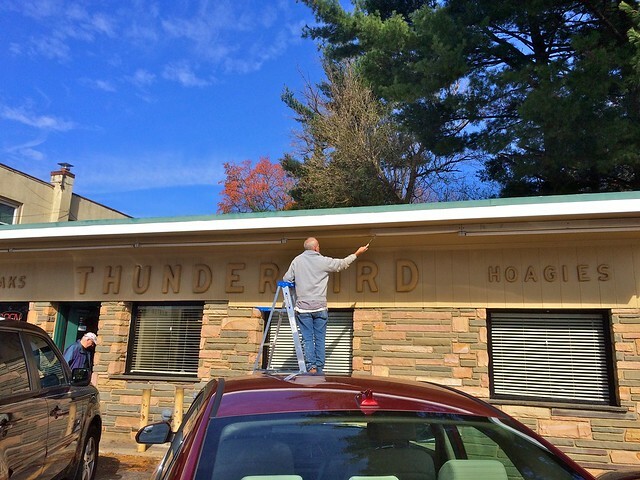 They've assured me that there aren't going to be many more changes coming up, so we can all continue to visit the Thunderbird, knowing it is in good shape. 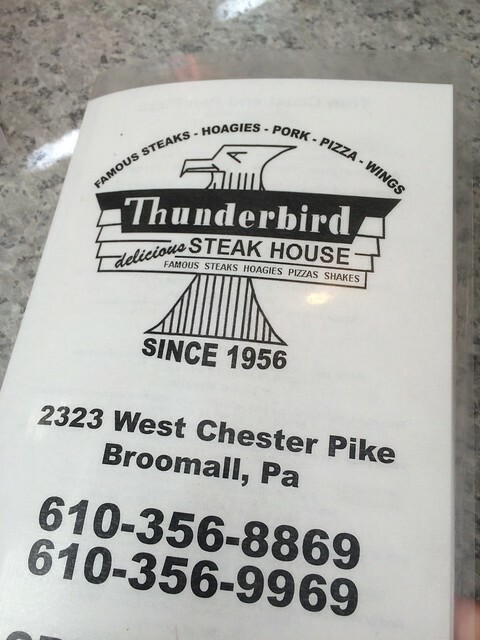 So when she was told by a fellow "Pocketeer" Adrian H. that the Thunderbird was the real deal, she and Retro Roadhusband met up with him for a Retro lunch! As we pulled into our parking spot out front, Mod B was horrified to think that her nightmare of the world being "blandified" was happening right before her eyes, as a coat of beige paint was being applied! Noes!!  However, upon quizzing the painter, and then following up with the owner later, her fears were assuaged, as they were freshening up the paint outside, and the letters would soon be a nice shiny black. As we entered the restaurant I was pleased to see that they had counter service as well as tables. 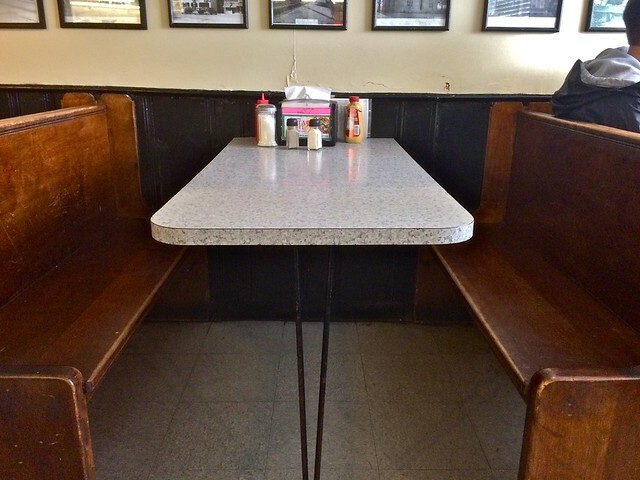 Old wooden booths flanked Formica topped tables with wrought iron hairpin legs, testifying that this was no "retro-vation" but the original fixtures since the Thunderbird opened in 1956. 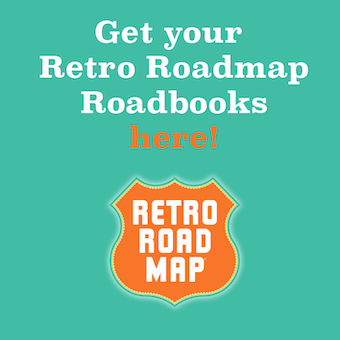 They're still family-owned and operated, a plus in the Retro Roadbook as well. 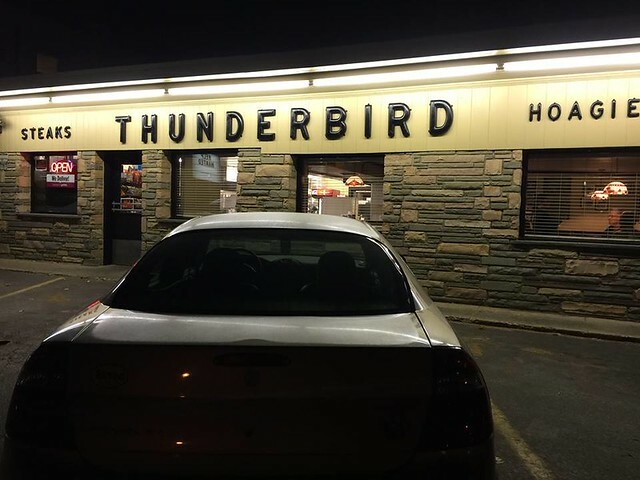 Our waitress let us know that the place was named the Thunderbird after the car, a fave of the original owner. Hoagies are what the folks in these parts call what I would call a sub, and the menu at the Thunderbird is loaded with them. Philly area folks are particular not only about their hoagies and cheesesteaks, but even the bread they are served on - so when I tell you that they use Amoroso's rolls at the Thunderbird, that's a good thing. Adrian knew I might like the pizza at the Thunderbird, since I'm originally from Massachusetts. 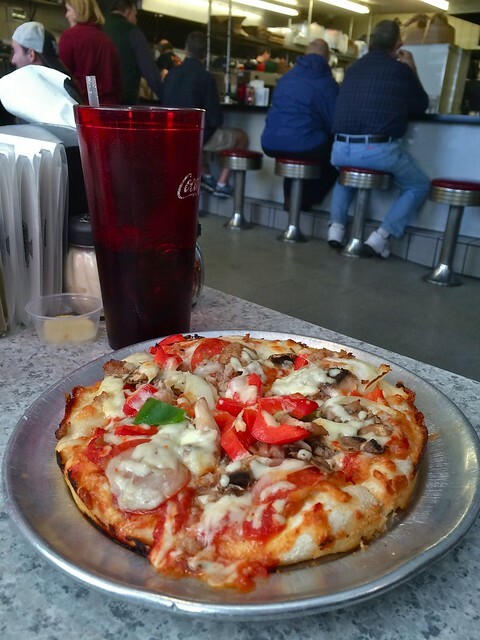 You see, unbeknownst to me, the pizza I grew up with was not Italian style pizza, but rather "Greek" style pizza, with a slightly puffy crust, baked in pans. 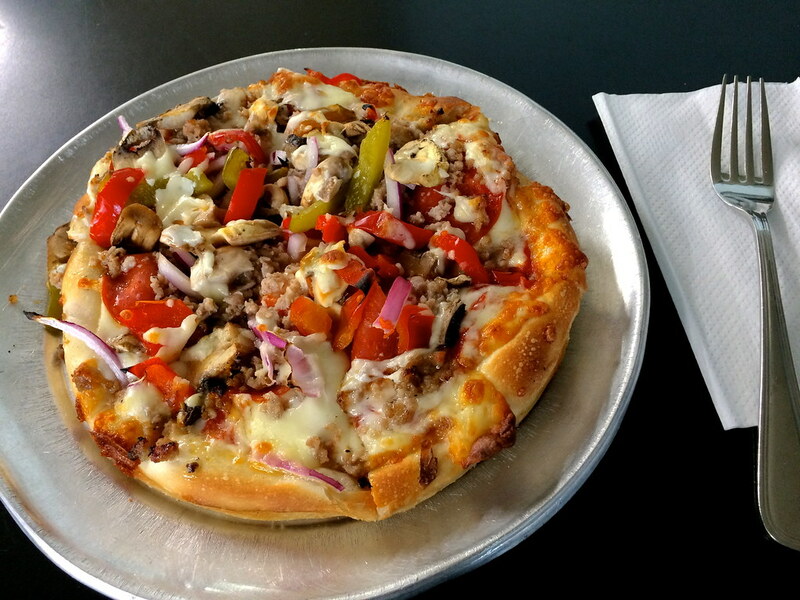 Heck, we just called it pizza. But in this neck of the woods they refer to this as "New England Style" or Boston style pizza, and to me it tastes like home. This is a mini size, and more than enough for me! Food was delish, fries were better than average and service attentive but not pushy. 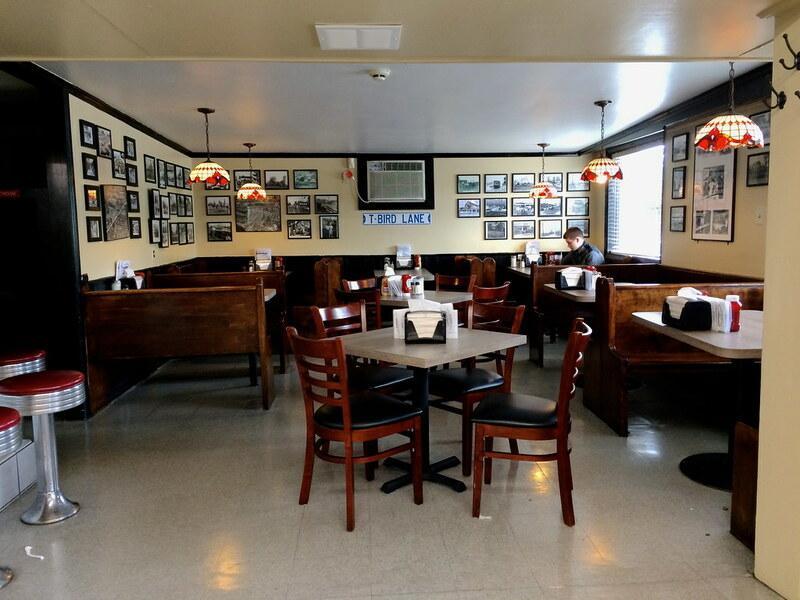 The place was brimming with folks getting takeout orders, moving tables to accommodate wheelchairs, young folks coming in and old folks meeting up. Friendly banter between the cooks and the guests and a homey feel for sure. I did not want to catch folks in a random photo, mouth agape as they eat,, so here's one of those hairpin tables I mentioned above! 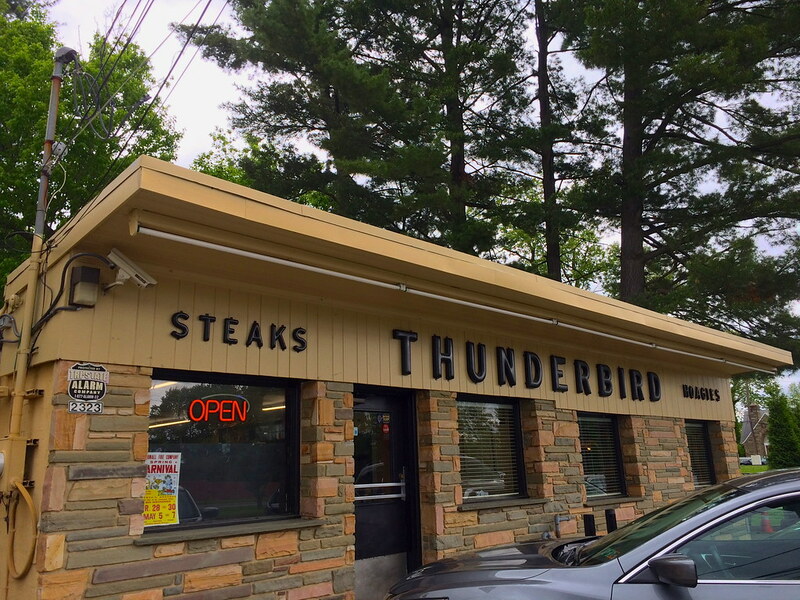 The great thing about the Thunderbird is that they're just a few minutes off of busy interstate 476, so you now have a place where you can hop off the highway and get a tasty bite to eat in an authentic sandwich shop instead of a chain. They are open 7 days and even serve breakfast too! Update! 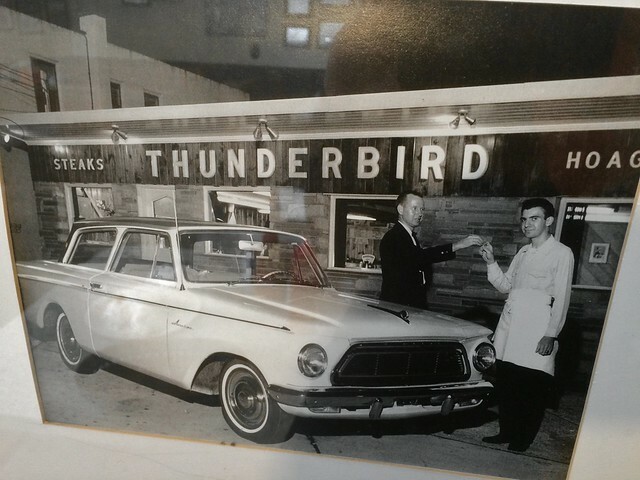 According to commenter Bob Kuhn who used to work at The Thunderbird in the late 1960s, the story of the naming is that owner "Sam Greco honeymooned with his wife in Las Vegas and stayed at a place called the Thunderbird. He liked the name so much that he gave it to this fine establishment!" That totally makes sense if you see the similarities between the Las Vegas Hotel sign and the one on the West Chester Pike. 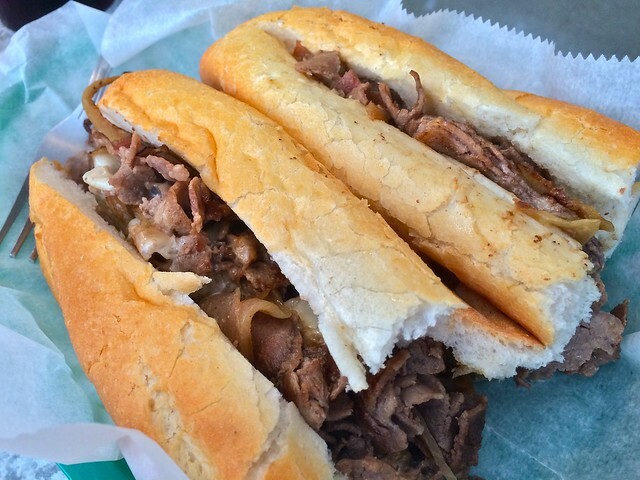 One of the best Broomall eateries! But I need to make one correction as I worked for the original owner in the late ’60’s. His name was Sam Greco and the story goes that he honeymooned with his wife in Las Vegas and stayed at a place called the Thunderbird. He liked the name so much that he gave it to this fine establishment!